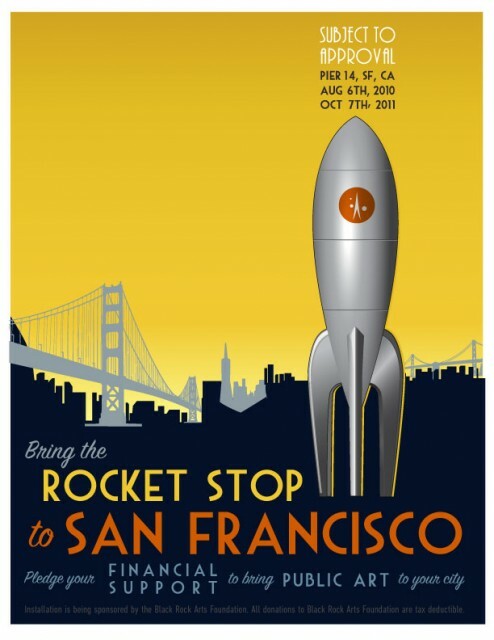 That’s right folks – at the Port Commission of San Francisco’s next meeting, on Tuesday June 8th, they will discuss and have the opportunity to approve the installation of the Raygun Gothic Rocket at Pier 14 on the SF Embarcadero! This is a tremendous opportunity for the crew and supporters of the Rocketship, for the Black Rock Arts Foundation, and for all of those citizens that would like to see more public art in our city. Although the rocketship will be closed to visitors, we are designing an informative kiosk, very much in keeping with the overall aesthetic of the ship, that will delight and share our story with the public. Cast in the guise of a ‘rocket stop’, it is to space travel what the bus stop is to public transportation. The (open session of the) Port meeting will be held on Tuesday June 8th, beginning at 3:15 PM. We are item #10 on the agenda. Public comment is permitted, and we’d love to see some of you come out and voice your support for this opportunity. Rest assured we’ll be in touch following the meeting. Grab your towel, and get ready for an adventure! This entry was posted on Sunday, June 6th, 2010 at 7:20 pm	and is filed under News. You can follow any responses to this entry through the RSS 2.0 feed. You can leave a response, or trackback from your own site.